In your search for a veterinary facility, we believe you should expect high quality care as well as great service. Our goal has been to assemble a veterinary health care team committed to providing exceptional client service and veterinary health care. Our commitment to you is to continue to offer our world class service and a state of the art veterinary rehabilitation facility. As a courtesy to your primary veterinarian and to ensure continuity of care, we will request a referral for rehabilitation, Integrative medicine services, and recreational swimming from your regular veterinarian or surgeon. We typically will request this referral form prior to your first visit. Call us at (610) 865-4348 to schedule an evaluation appointment for your pet and to obtain the referral form for your vet. If your dog is free of injury or any health issues and you wish only to have him participate in our fun swim program, you will need a referral from your vet and a swim test appointment with one of our trained therapists. What happens during an acupuncture or rehabilitation evaluation? During the initial evaluation and consultation, Dr. Mayers (rehabilitation) or Dr. Gabriel (integrative medicine) will obtain a detailed history of your pet and perform a thorough physical examination. This will cover recent problems or surgeries, past medical issues, diet, medications, your pet’s home environment/exercise patterns, and your goals in regards to your pets' treatment. We will review any records and/or x-rays provided, analyze your pet’s gait, and take measurements of joints and muscles if appropriate. The doctor will then outline a proposed treatment plan optimized for your pet. For rehabilitation patients, a home exercise program will be explained and demonstrated to you. Any recommended supplements or diet modifications will be discussed as well. Prior to your evaluation appointment, we will happily contact your primary or referring veterinarian to obtain your pet’s medical records, including any radiographs or advanced imaging studies pertaining to your pet’s condition. Please bring your pet on a collar and leash suitable for walking. We strongly advise against the use of retractable leashes (also known as “flexi-leads”) which may make it difficult to control your pet around the pool or on the land therapy course. If your pet has food allergies or dietary restrictions, it is helpful if you bring some acceptable treats along. Please bring a list of all your pet’s current medications and description of his diet. A towel for blanket for the car ride home is recommended if your dog is not crated in the car. In winter, a coat or sweater for your dog to wear home is highly advisable. Absolutely! Owner participation is an integral part of most therapy sessions and you are encouraged to attend. This helps your dog feel more relaxed and motivated, and is important for you to learn how to perform your home exercise program. In isolated cases, dogs may perform better if their owner is not present and we may ask you to wait in the waiting room. Please understand that our goal is always to provide the best possible treatment experience for your pet. Can I drop my dog off for therapy treatments? Yes! We offer day boarding for our patients if you need to drop your dog off and pick up later in the day after their therapy session. If you will be out of town, are unable to care for an immobilized pet during recovery, or your pet needs intensive daily therapy, we also offer Intensive Medical Boarding in conjunction with Wright Veterinary Medical Center which enables your pet to receive all aspects of both his home and professional therapy program. 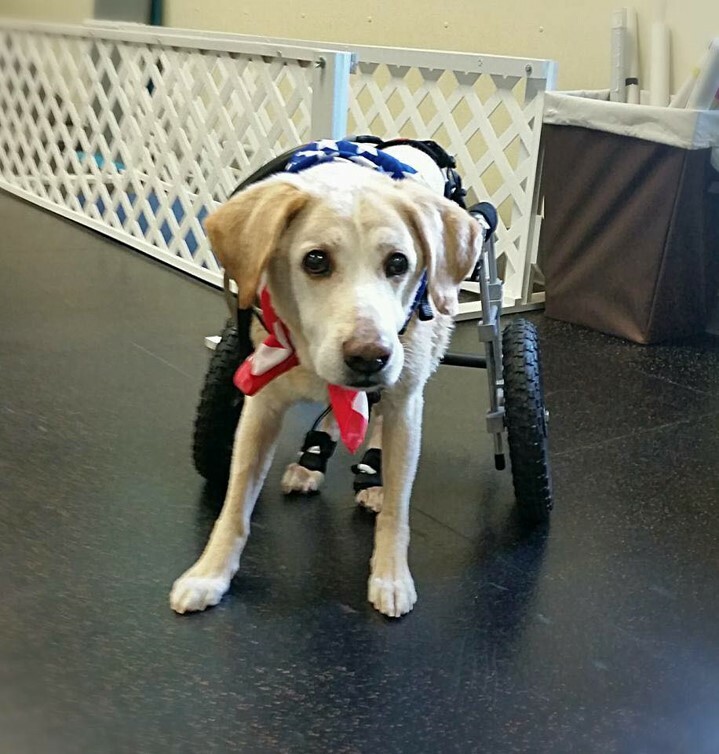 Is my dog too old for rehabilitation? No dog should be denied the possible benefits of rehabilitative therapy without first having a professional evaluation. Many of our most satisfied customers are senior dogs who gain a new lease on life through our age-appropriate gentle exercise and stretching programs. What if my dog doesn’t like the water? While we have dogs of all ages, breeds, and sizes who love the water, we also see many dogs who have little to no experience with water or swimming. Almost all patients become comfortable enough with either the pool or treadmill to exercise. A gentle introduction and treats go a long way to helping dogs into the water. At the Animal Therapy Center we use many methods to acclimate them safely. We frequently treat cats with acupuncture and LASER therapy and have also seen cats for hydrotherapy. We even had a rabbit as a patient who used the underwater treadmill! The initial evaluation appointment is conducted by a doctor and lasts approximately 60-90 minutes. Follow up appointment times vary based on your pet’s treatment plan, but usually do not exceed 50 minutes. Won’t the pool chemicals hurt my dog’s coat? We use bromine and a UV filter rather than chlorine and careful maintenance helps us keep chemical levels low. Most dogs do not experience a problem as bromine itself does not cause skin irritation – it actually can reduce dandruff and increase circulation to the skin. More commonly, rashes or hot spots are caused by moisture trapped under thick coats. To avoid this, ensure that your dog dries off completely after a hydrotherapy session by bringing extra towels for the ride home. If your dog is especially sensitive or develops any problems, we can rinse them off with fresh water following each aquatic session.